The most abundant species recorded here is the critically endangered hawksbill sea turtle, whose shell is coveted for making jewelry and other items. Our studies at Gallow's Point aim to assess the importance of this small section of the Belize Barrier Reef for hawksbill sea turtles, and other species that also utilize the area. Gallow's Point Reef is a 5 mile section of the Belize Barrier Reef 10 miles east of Belize City that extends from the St. George's Caye Channel to South Gallow's Point. The coral reef ecosystem and associated sea grass beds provide important developmental habitat for juvenile, sub-adult and adult sea turtles. ECOMAR has been conducting in-water snorkel surveys to assess sea turtle abundance and diversity at Gallow's Point since 2009. Our studies have shown that the fore reef is important developmental habitat for juvenile hawksbill sea turtles. The methodology for these surveys is quite simple – snorkel the reef, record species and size of turtles sighted, and attempt to capture turtles observed. The last part sounds a lot easier than it actually is, since turtles swim VERY fast underwater! Traditional fisherman become important conservation assistants since they spend their days on the seas and have the skills required to swim quickly and dive deep to capture sea turtles. 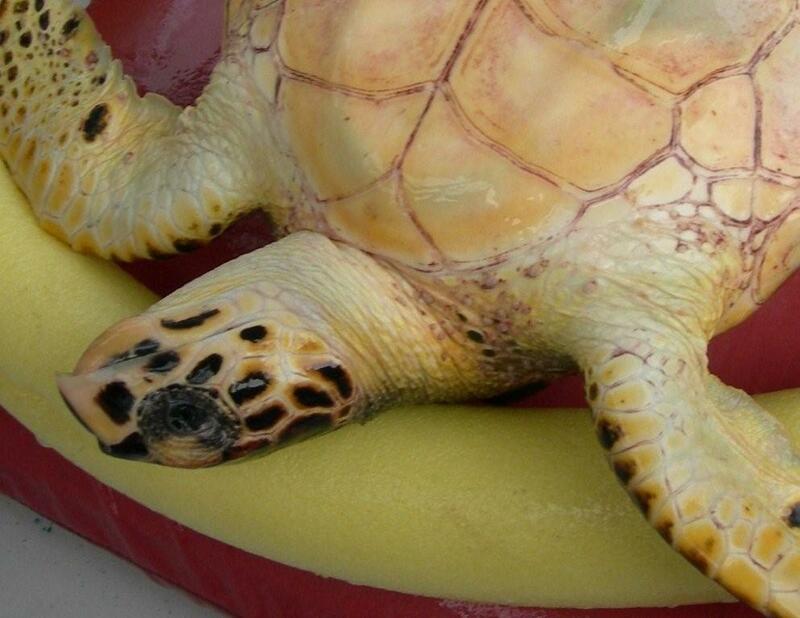 Captured turtles are placed on styrofoam noodles and boat cushions while on board and wetted down repeatedly. Photo ECOMAR. Survey teams mark the location where they begin with a GPS, record the time, and swim parallel to one another and the reef to cover a large area of reef. The depth they survey is between 10-30 feet, and those that can dive deeper survey the deeper waters. When a turtle is observed the team takes turns free diving down top the turtle. When successful the diver holds onto the mid points of the turtle carapace and holds it head up allowing the turtle to swim to the surface on its own. 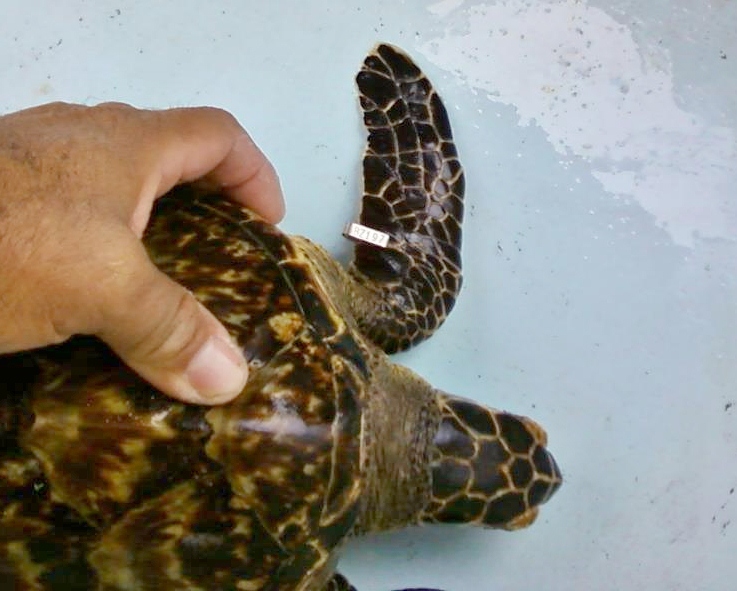 The location and species of sea turtle is recorded and a series of measurements are taken on the boat including size and weight, and they are also tagged using flipper and/or PIT tags depending on their size so that when they are recaptured in future surveys, the data can be compared. Photos of the carapace and head are also taken to aid in our photo ID studies. The turtle is then released back into the sea to continue on their way! Fishermen Martin Pariente Jr becomes a conservation assistance when he assists ECOMAR with our In-Water Turtle Surveys at Gallow's Point. He and Melanie Day are preparing the turtle for measurements prior to release. Photo ECOMAR. Map showing location of Gallow's Point Reef. Juvenile hawksbill turtle with a small flipper tag. Photo courtesy Hol Chan Marine Reserve. The Gallow's Point Turtle Project has been featured on several international television shows including: Animal Planet, Blue Mission and Wildlife SOS. 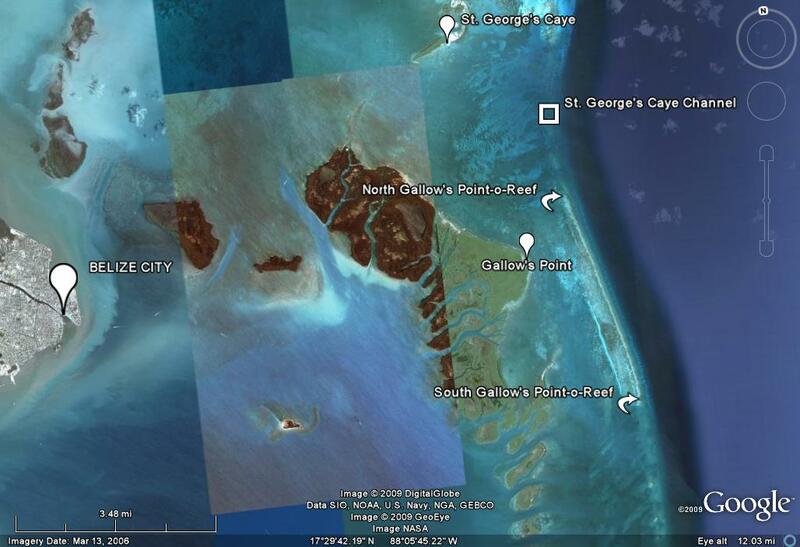 Each visit has enable us to collect additional data on the sea turtles that utilize the Gallow's Point Reef. Wildlife SOS is a long-running documentary series presented by Simon Cowell MBE and featuring the work of the Wildlife Aid Foundation and its partner wildlife charities in Britain and around the world. Wildlife SOS was first broadcast in 1997 on Channel Five, and since then has run continuously on Discovery Channel’s Animal Planet. It has also been co-produced by ITV Meridian and ITV London. Episodes 10 & 11 were filmed in part in Belize and featured the work of ACES crocodile rescue and the Gallow's Point In-Water Sea Turtle Project. 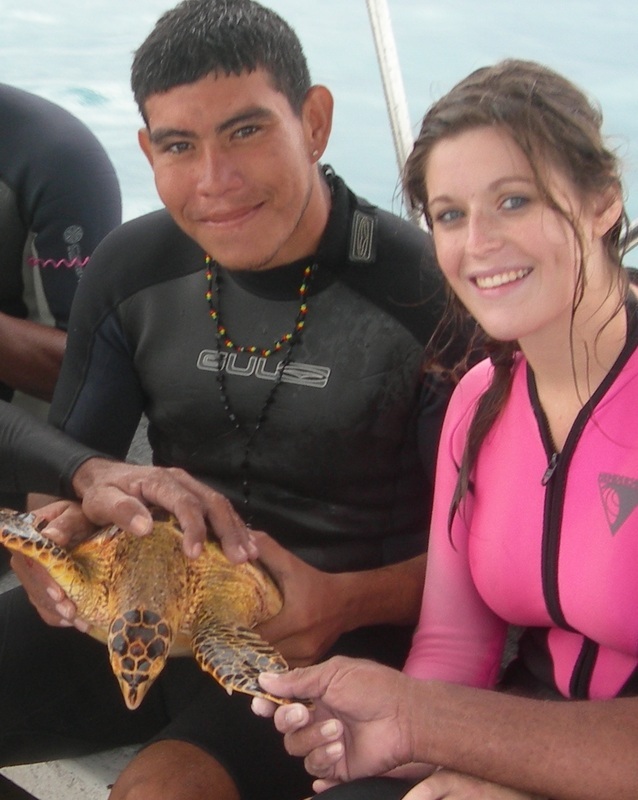 In the winter of 2010, the Sealliance team made a 10-day trip to Belize to highlight research being conducted by scientists studying coral reefs, mangrove forest, and sea turtles. They traveled to Belize City, Ambergris Caye, Lighthouse Reef Atoll, and Turneffe Atoll, and were on a mission to show the difference between areas under protection and areas outside of protection. The difference was staggering in some locations. The team interviewed scientists, filmed sea turtle research, tagging programs, and documented several coral reefs areas, both in and out of reserves. Follow the link to Amazon and view the entire episode. Episode 3, The Bounty Hunter, has David Schultz in Belize searching for deadly but endangered animals, like crocodiles, sharks and rays. His goal is to collect blood and tissues samples needed for research before these exotic creatures disappear. David helped us collect tissue samples and inserted a PIT tag in a captured hawksbill sea turtle at Gallow's Point Reef.